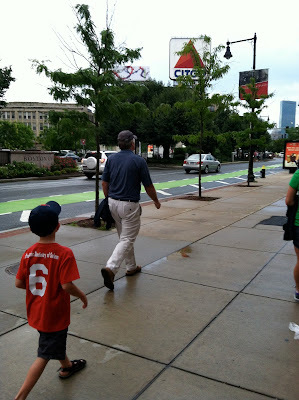 I teared up as I watched Z walk into Fenway Park for the first time. His eyes were wide as he took in the sites of the field, bright lights and thousands of people. As we walked to our seats I had flashbacks of my first game with my dad over 25 years ago. Tears started rolling down my cheek, this day had been something I had envisioned and waited for since the day I found out I was pregnant. 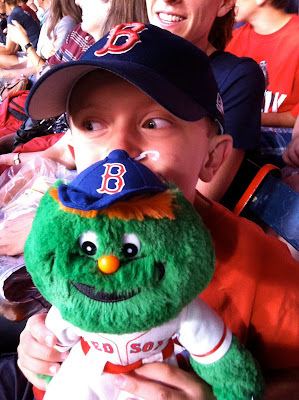 I was so looking forward to the day when I could take my own children to Fenway Park and share my love for the Red Sox with them. Thanks to my dad and sisters the vision was now a reality.....it was truly magic. Dinner for Z consisted of his first "Fenway Frank", a pretzel and a giant lemonade (hence the bathroom breaks). He was fascinated that you could buy food right at your seat! Dessert was ice cream that he got on a bathroom run with Chi Chi :) In the fourth inning I bought him a Wally Stuffed animal as a souvenir for his first game. My dad had bought me a Red Sox teddy at my first game and I had to keep that tradition alive. What a smile it brought to my face to see him hug his Wally as I told him about my special teddy bear tucked away in my memory box. He asked, "Can I see it when we get home mom?" When the game ended and "Dirty Water" was playing on the speakers, I smiled at Z. He looked up at me and said, "That was Awesome!" His heart was with mine now, a heart that loves the Red Sox through and through, a heart that will cheer them on through good and bad. Z had such an amazing time and it is hard to say who had more fun. It was a magical night and a memory that I hope that I will hold onto for all the rest of my days. Thanks Dad, Kristen and Laura for making it happen! Looks like he had an amazing time.